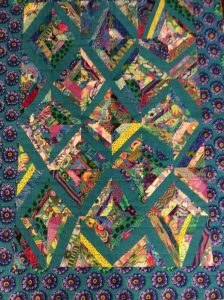 String quilts are such fun and are great for when you want to make impressive quilts without a lot of complicated steps AND you use up those strips. But oh those Selvages! 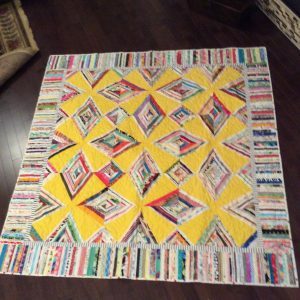 I will give you lots of inspiration for things to make with Selvages (or strings if you haven’t started saving your Selvages). 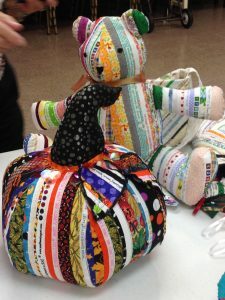 You will have plenty of time to make either a pincushion or an eyeglass case during class time or to start on a larger project. This is a three hour class. Supply List: You will need basic sewing and cutting supplies including your sewing machine. If you want decorative stitches to embellish your selvages you will need a machine that has those stitches. Selvages any length and between 1 1/4″ – 3″ in width, strings (or strips) any size width and length, and some muslin or broadcloth or any light colored lightweight cotton for your base are all the fabrics you will need to get started. A pencil or pen that does not erase with ironing will be helpful to keep your lines straight. For the pincushion : some piping to embellish the edge and your stuffing of choice. For the eyeglass case: a small piece of flannel or batting, about a 12″ square of lining fabric and some bias tape to enclose the edges are all you need.